Female Chinese Guardian Lion by Teresa Mucha - 8.000" x 8.000"
Female Chinese Guardian Lion framed print by Teresa Mucha. Bring your print to life with hundreds of different frame and mat combinations. Our framed prints are assembled, packaged, and shipped by our expert framing staff and delivered "ready to hang" with pre-attached hanging wire, mounting hooks, and nails. 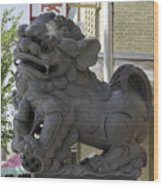 There are no comments for Female Chinese Guardian Lion. Click here to post the first comment. 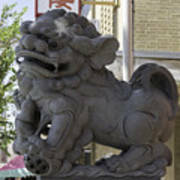 Traditionally statues such as this female Chinese Guardian Lion have stood in front of the wealthy homes or important government buildings and palaces in China. They stand at the entrance and consist of a pair, a male and female. The female always has a pup that she is protecting and the male has an embroidered ball that he guards, showing his power and authority. The statues are always very ornate and also symbolize yin and yang. 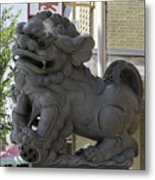 They are also known as Shi or Foo Dogs, but they represent a Lion and have nothing to do with dogs at all.